Sardone v1 Jet build with testbed - Poor Max static thrust 12Kg - Would you help? yours is the same as mine, just zoomed in, blue is rpm?! Your graph starts at ~19kRPM and stops at ~17kRPM, bring it down to 0RPM and it looks exactly the same. Just different axis scaling and zoomed in. Also be sure not to mix up electrical input power with mechanical output power. For the SSS56104 motor I keep seeing amazing 14kW mentioned but in fact this is electrical input power with 0 rpm and thus zero output power. 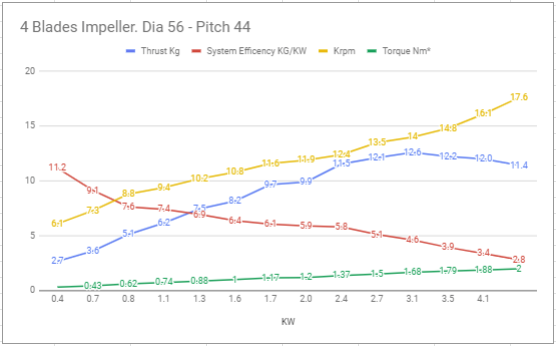 I could not find any max torque for the other kV flavors of the 56104. Would be interesting to see if they achieve higher torque but I doubt it. I’m sure there is something to take here, but I’m not sure what it is yet. At this point, my best guess is that I’m not using all the current I should at a given speed. So my motor is somewhere in the red cloud and I have to find a way to stay as close as possible to the stall current to maximize the output power. A way could be to increase the pitch of the impeller. Does all the above make sense? Does anybody know what happens when I exceed the stall current? Does the motor stop and the ESC shut it down? Motor burns? @Giga I downloaded an Acoustic Tachometer. I can’t wait to see how it works. Paolo, any luck with measuring rpm? Without that, you don’t know where on the red line you are. Btw: you cannot be below the line, only on it. I highly doubt the 1600A stall current, I would guess it’s rather in the 200-300A range @125V. At 60V it would be 100-150A stall and 20,000 rpm max. Since you measured 50-60A max, my guess is you’re getting about 10,000 rpm. Which, together with the relatively small impeller, might explain your max thrust. One thing I saw in my tests: as soon as there is air bubbles in the bucket, thrust to power eatio goes down dramatically. One last thought: thrust is a function of water speed before being accelerated by your prop vs after being accelerated. In free water, at zero board speed, input water speed is zero, thus giving you max thrust. However, in your closed bucket system, the water will go in circles, essentially increasing your input speed quite a bit. This might result in unexpected low thrust. I think I have seen the same problem with my setup. I’m as well testing in a relatively small Ikea box. What I see when ramping up prop speed is a short maximum in thrust and then a static value that is much lower. any luck with measuring rpm? It works in the dry test! With some luck it will read speed also in the wet test. Finger crossed, tomorrow I try. Very cool! 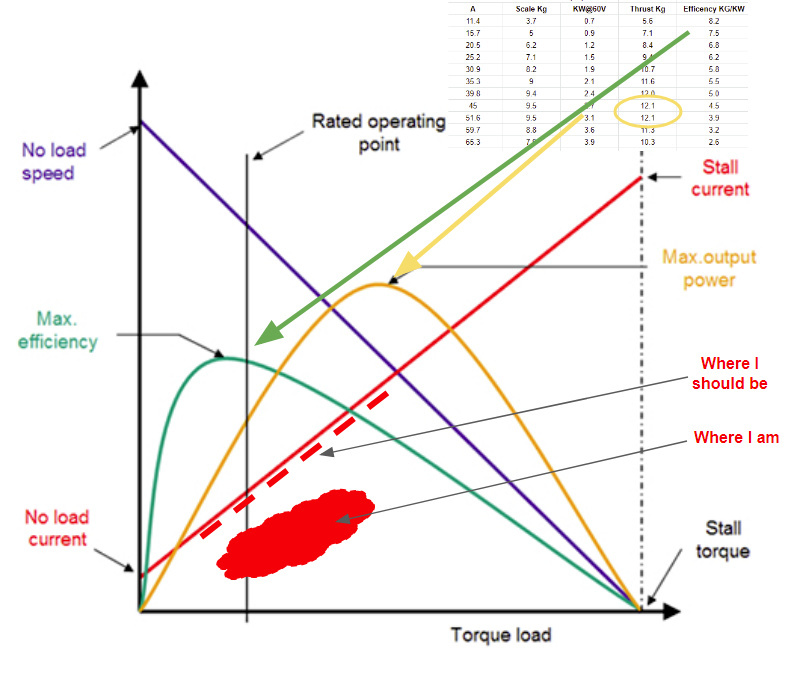 So did you find out why you saw the high no load current after your last test? 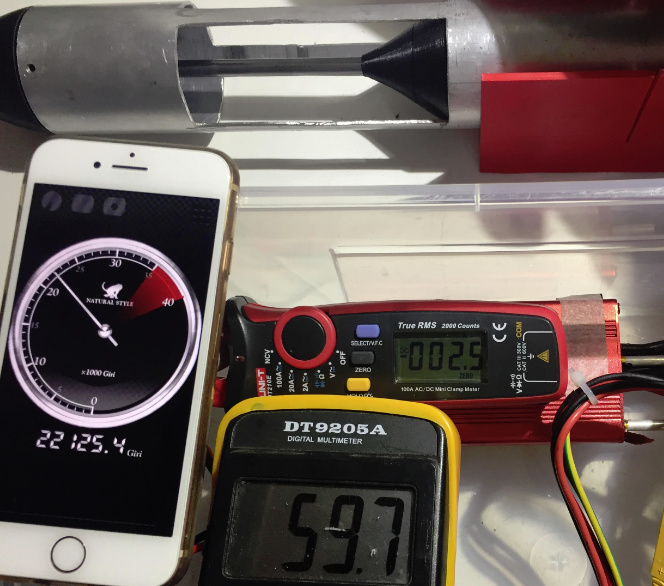 Thanks to @Giga app ( Acoustic Tachometer) I now have the RPM with reasonable accuracy. I’ve done 2 tests, same setup, but one with the 4 blades impeller (pitch 44mm) and one with a similar 3 blade impeller (pitch 33mm). Some suggestion says that probably my testbed (testpit actually) is introducing mismeasurement. Yes, it might be, but I’m still convinced it should work. 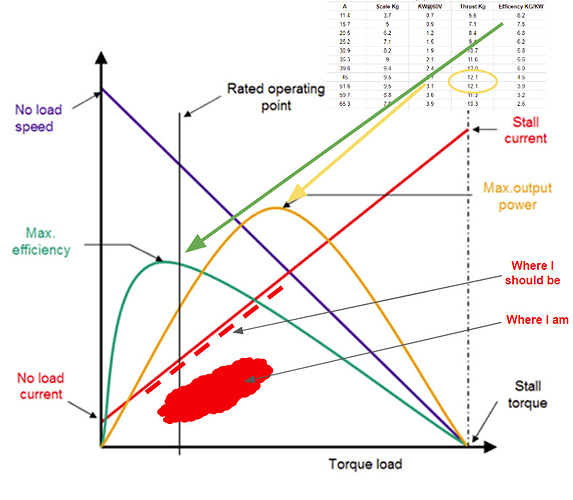 you find out why you saw the high no-load current after your last test? I have a severe leakage issue probably introduced in one test when I enlarged the intake pipe windows. I think the impeller is not aligned with the motor and the double lip seals leaks. Recently every time I run a test I see that effect. I’ll figure out how to solve it later. Efficiency is a nightmare now. Impressive work! 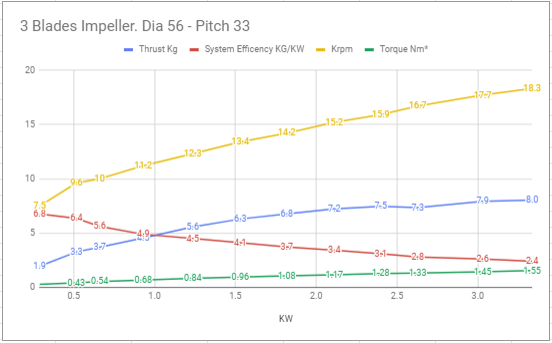 Actually I would not say your thrust decreases above 3kW, it rather doesn’t go beyond 12kg, which holds true for both impellers. Given that, I still think you won’t see this loss of thrust in open water. Which then gives you a max thrust of close to 20 kg, which should be sufficient to get on the foil. Just speculating but you should definitely try.